Attached HORIZONTAL format of my composite of 3 works of commercial illustration of a steamboat, the 2nd and 3rd having been derived from the 1st. N.C. Wyeth painted a jaunty little sternwheeler PRAIRIE BELLE for the title page of the 1912 edition of John Hay's poems written in 1871 called PIKE COUNTY BALLADS. The little steamboat referred to the first poem JIM BLUDSO OF THE "PRAIRIE BELLE" (we have the illustration Wyeth painted of steamboat Engineer Bludso on another page). In 1936 Norman Rockwell illustrated Mark Twain's TOM SAWYER for Heritage Press and Rockwell made a drawing based on Wyeth's painting of the "PRAIRIE BELLE" as an illustration for the heading of Chapter 29 on page 225. 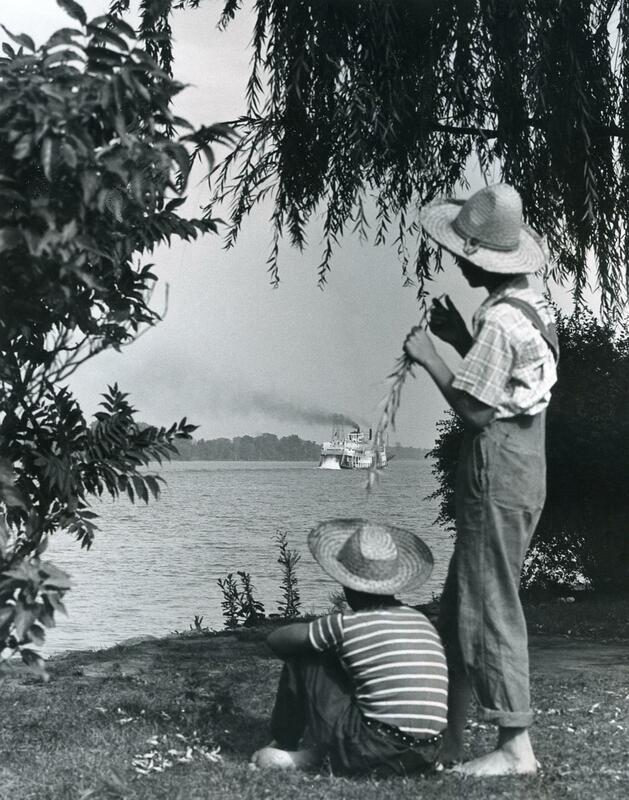 In 1949 artist John Gannam put Wyeth's PRAIRIE BELLE in the far left in the distance on the Mississippi in a painting of Tom and Huck on a raft in the foreground published as a magazine ad for John Hancock life insurance. It's heartwarming to see Rockwell and Gannam paying homage to Wyeth the way they did. Google Doodle - On Mark Twain's 176th birthday, November 30, 2011 they ran the attached graphic of Tom Sawyer getting somebody to whitewash Aunt Polly's fence for him. "Say - I'm going in a-swimming, I am. Don't you wish you could? But of course you'd drutherwork - wouldn't you? Course you would!" 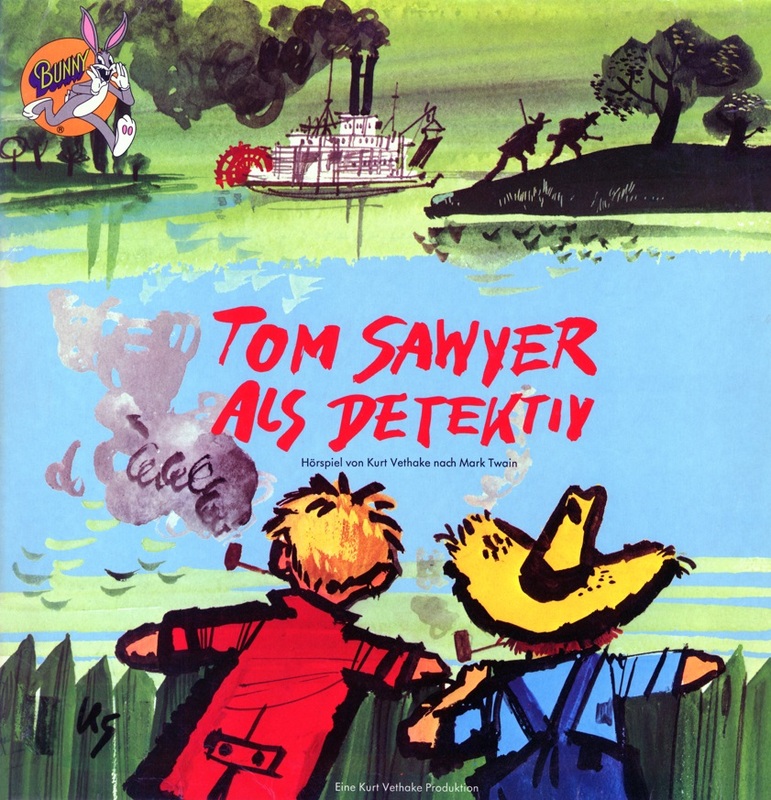 German recording of a dramatization of "TOM SAWYER ALS DETEKTIV"
TOM SAWYER ALS DETEKTIV: Outstanding cover art for a 1975 German language dramatization on an LP of TOM SAWYER DETECTIVE by Sam Clemens. I can't find the artist's name but the same person illustrated a companion volume of the novel (where they are also uncredited) which features a variation of the LP jacket art for the book cover. The sternwheel steamboat, at center on top is charming in the artist's spontaneous brushwork. 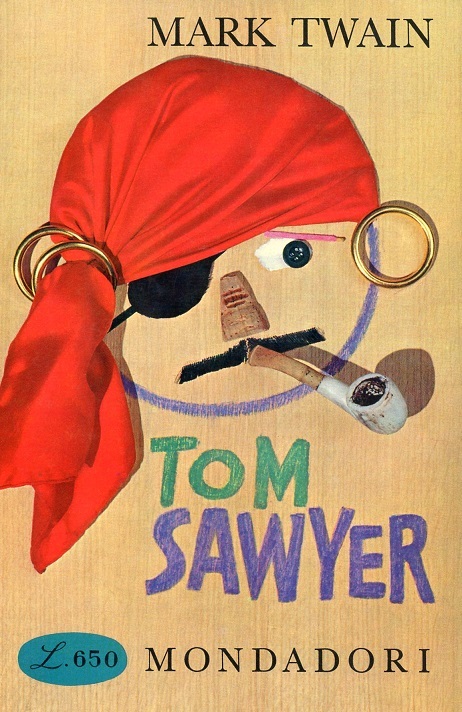 The style of the artwork is similar to other German editions of TOM and HUCK in my collection, the initials U.S. in the lower left hand corner are probably a clue to the artist's identity. The LP was produced by Kurt Vethake for WEA Musik GmbH. The companion edition of the novel was published by Boje-Verlag in Stuttgart. 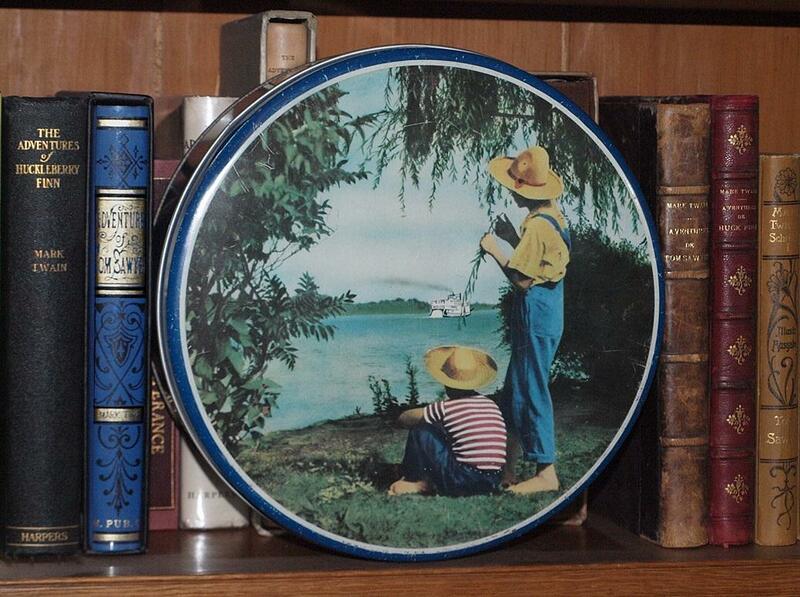 Attached photo of a cookie tin with a colorized picture on the lid of "Tom and Huck" circa the 1930's at Nipper Park in Hannibal with the GOLDEN EAGLE paddling down the Mississippi in the distance. The tin measures 10 inches in diameter by 3 3/4 inches high. There is no text printed anywhere on it so we can't determine when this was manufactured and what sort of delectables it originally contained. I have only seen one of these before, in "Pudd'nhead's" gifts and antiques in Hannibal, MO on Bird Street. "Pudd'head's" tin was "not for sale" so I was very pleased to find it listed on Etsy last week. Massie's original photo is attached for comparison along with a colorized postcard from Massie's photo of the boys and the steamboat taken a few minutes earlier as it passed Nipper Park. Massie took many photos for the Missouri Commerce division to use in publications to promote tourism, in this case of "N.E.MO." 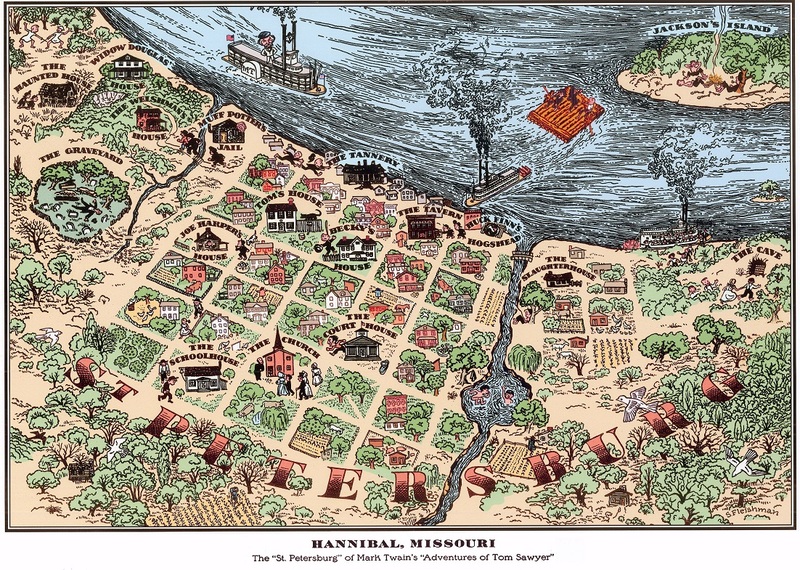 (local abbreviation of North East Missouri) and Hannibal which was so richly endowed with nostalgia by Samuel L. Clemens (Mark Twain) whose novels about Tom Sawyer and Huckleberry Finn created a world so believable that many readers thought the boys and their adventures were real. Clemens accessed his memories of people, locales and events which were often depicted in his novels very much as they were in the 1840's and 50's. I photographed the cookie tin on a book shelf downstairs in which you can glimpse just a few of my editions of The Adventures of Tom Sawyer, The Adventures of Huckleberry Finn including the first publications and also many foreign language versions. This collection contains Massie's work while employed with Commerce and Industrial Development and his early photography while living in Kansas City in the 1930s. As state photographer, Massie was in charge of developing the visual concepts for Missouri's regional booklets and tourist advertising. This collection, like the Commerce and Industrial Development Collection, depicts Missouri scenery, industry, agriculture and recreation, as well as special events, such as Sir Winston Churchill's visit to Westminster College in Fulton. 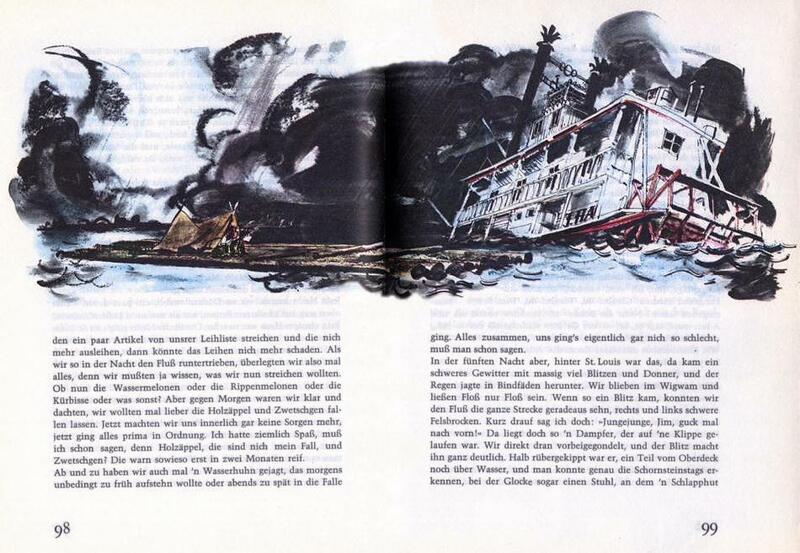 Attached panoramic illustration on 2 pages of a 1961 German language edition of HUCKLEBERRY FINN by Horst Lemke. Huck Finn and Jim are on their raft in the left half of the painting. In the novel the wrecked steamboat was named "WALTER SCOTT" but the name of the boat in Lemke's painting looks like it starts with "J. HA . . ." like "JOHN HANCOCK. "The steamboat: Nice watercolor and ink style of the 1960s. Yes: In the text, interesting translation of the dialect, and there is no mention of the steamer's name." Andreas' Dad Benno did some illustrations based on TOM SAWYER for posters used in classroom teaching around 1960 in a style reminiscent of some of the avant garde animated cartoons of the '50's. Andreas spent his boyhood in Dessau on the Elbe river in Germany. 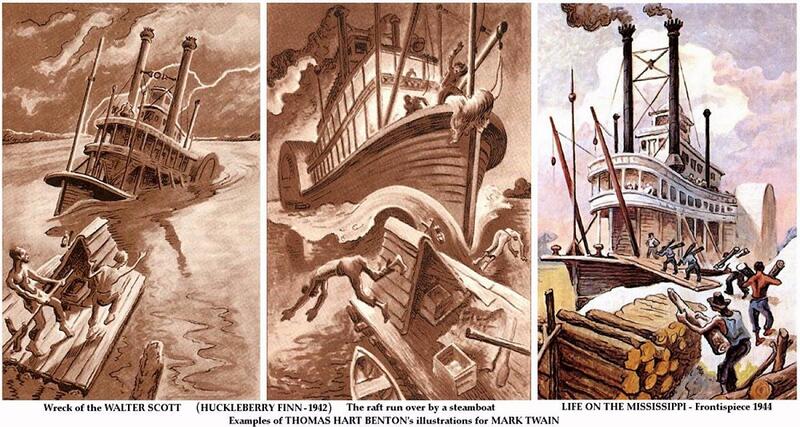 Captioned composite of three of Missouri artist Thomas Hart Benton's steamboat illustrations for Limited Editions Club's HUCK FINN and LIFE ON THE MISSISSIPPI by Twain. 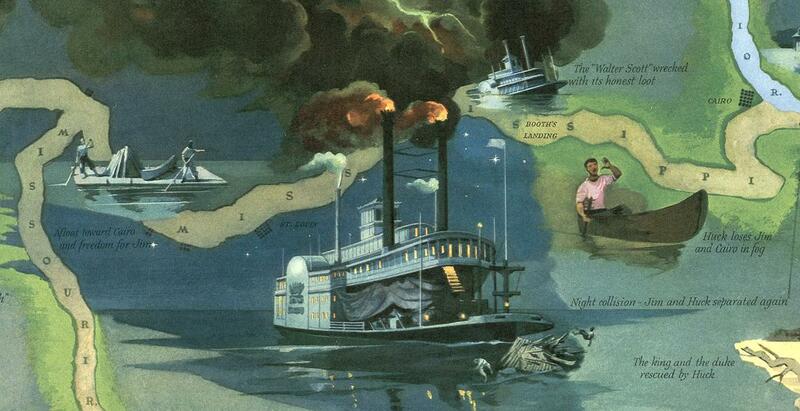 Detail from a pictorial map by artist Everett Henry depicting steamboat episodes that Mark Twain dreamed up for THE ADVENTURES OF HUCKLEBERRY FINN. 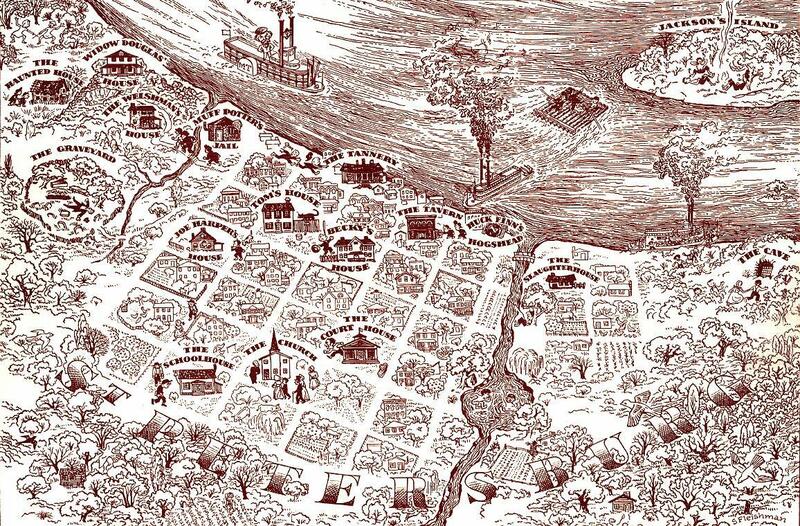 In 1958, during my 1st visit to Hannibal, I bought an approximately 11 x 14 inch print of a sepia-toned line drawing (from the Becky Thatcher Book Shop) that had been created by illustrator Seymour Fleishman of a whimsical map of Hannibal, MO as fictional "St.Petersburg" that he drew, probably in pen & ink originally with sepia-tone added during the printing process for the fly leaves of an abridged 1949 edition of Mark Twain's TOM SAWYER published by Scott, Foresman & Co., Chicago. Adding color to Fleishman's line drawing took a lot of man hours to do but it was a fun way to pass the time. Recently received this from a book seller in Italy. The artist who created the front cover is not credited but I admired the ingenuity of their concept to give this the flavor of having been made by a clever young boy. Apparently the background was a sheet of wood veneer on which was drawn in pastel the words TOM SAWYER, the circle defining the pirate's head, the white of the eye and perhaps the eye patch. The real components include red fabric for the pirate's head scarf, brass rings, pipe, half of a cork for a nose, a button for the eye, mustache may have been trimmed from some sort of brush and the eyebrow look like the end of a child's pink shoelace. The shadow of the pipe, head gear and rings etc. reminds me of a Trompe l'oeil painting. The assemblage was photographed then MARK TWAIN, MONDADORI and 650 lira added by the publisher for printing. The theme was inspired by Tom Sawyer's scheme to runaway from home as "pirates" on a raft to Jackson's Island with Huck Finn and Joe Harper. 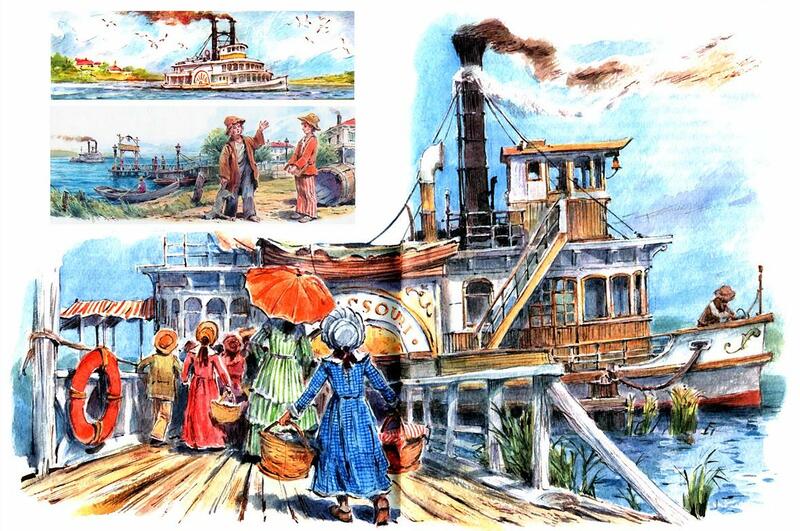 From a 2009 Russian edition of Mark Twain's ADVENTURES OF TOM SAWYER, here are 3 illustrations, the double page spread of the ferry MISSOURI shows women and girls carrying picnic baskets aboard for the picnic at McDougals's Cave downriver from St. Petersburg (Hannibal, MO). The two "widescreen" compositions in the upper left are from the front and back cover of the book. The second one shows Huck and Tom on the waterfront discussing how to cure warts. Am providing the credit page since I can't tell which of the contributors is the illustrator. 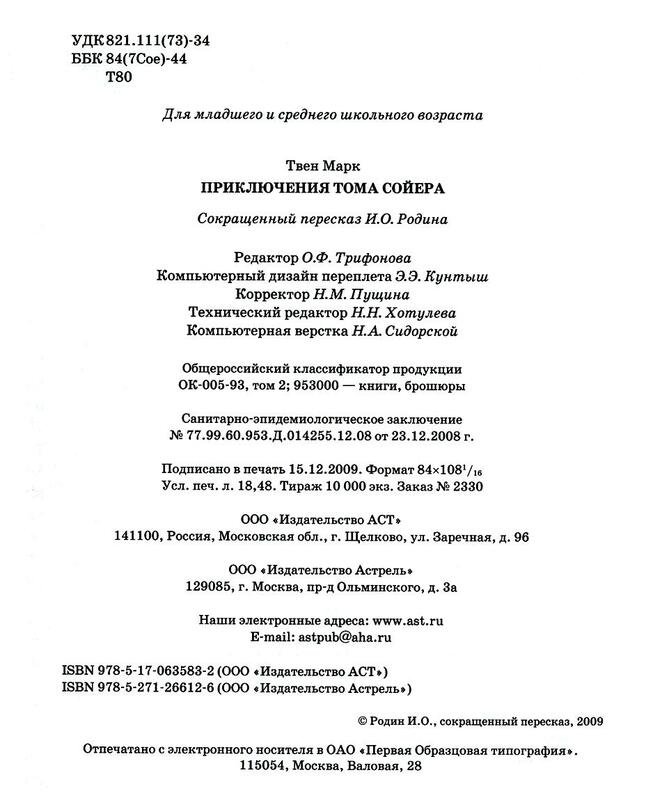 If you or I come across someone who is fluent in Russian we can get a translation of the particulars of the publication. The steamboats are not of the Mississippi River variety, they bear a resemblance to some of the Pacific Northwest boats (Columbia and Yukon rivers and Puget Sound etc.) Perhaps there were some boats of this style in old Russia. The artist's style is enjoyable and the colors beautiful. 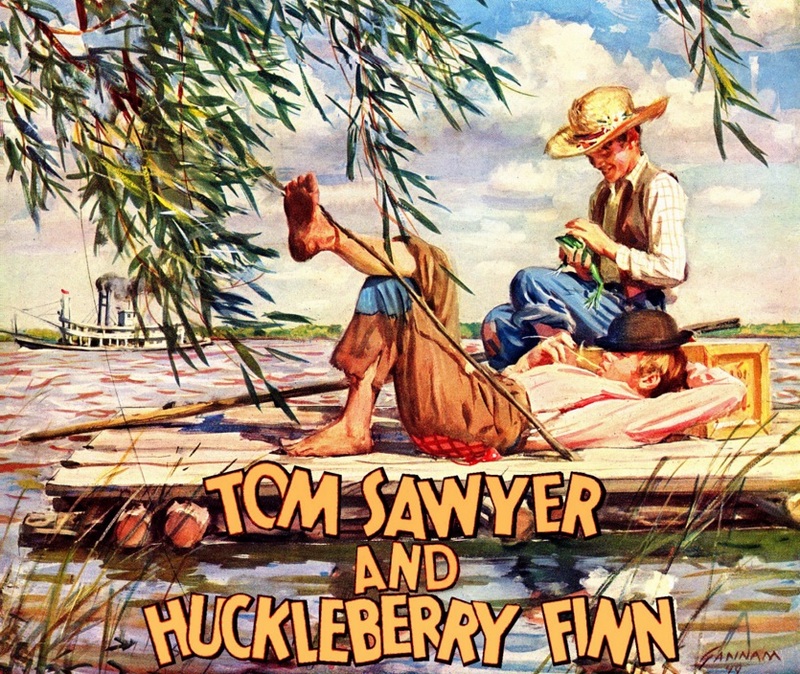 Illustration of Tom Sawyer and Huck Finn painted by John Gannam (1907-1965) for a John Hancock Life Insurance ad published in national magazines in 1949. I added the names of the boys from a font derived from the cover of a German edition of Mr. Sam Clemens' novels about Tom 'n Huck. Made the composite for Debbie Harris at her T's & Trivia store in Hannibal, MO which often incorporated designs featuring Clemens and his characters on T-shirts & tote bags. The German artist was probably inspired to use the "jumbled" style of lettering based on the font the Disney's title artists used to spell out the character names in the opening titles of many theatrical short cartoons that featured particular "stars" like Mickey Mouse, Donald Duck, Goofy & Pluto. 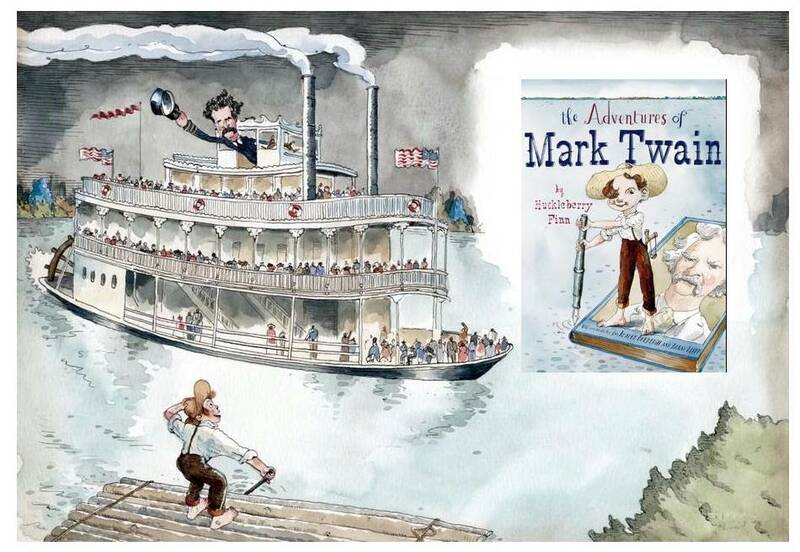 Attached composite I made of a double page illustration of Sam Clemens as a steamboat pilot with Huck Finn on his raft in the foreground combined with the front cover of the book Adventures of Mark Twain by Huck Finn.